positive it’s the first time you’ve ever met. 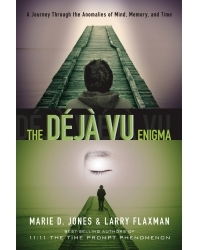 Marie D. Jones and Larry Flaxman are the authors of 11:11 The Time Prompt Phenomenon and The Resonance Key. They are the founders of ParaExplorers.com. and have been featured on many radio shows, including Coast to Coast AM With George Noory. Jones is also the best-selling author of 2013: End of Days or A New Beginning? and PSIence: How New Discoveries in Quantum Physics and New Science May Explain the Existence of Paranormal Phenomena. Flaxman is the founder and senior researcher of ARPAST, the Arkansas Paranormal and Anomalous Studies Team, and serves as technical consultant to a number of paranormal research organizations.